Yours is a Multipurpose Parallax scrolling One Page Template. To edit this template with Adobe Muse is very easy. You can change colors, texts or replace the images in a few minutes. Drag & Drop Content. 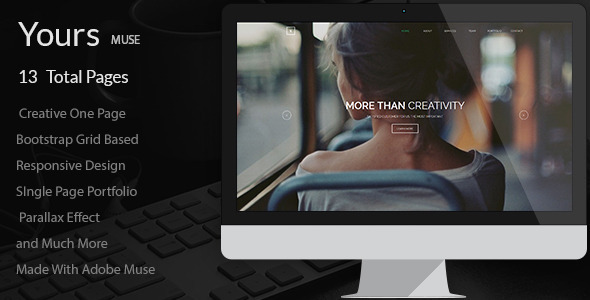 This is premium Adobe Muse Template build by Muse Master. Desktop, Tablet & Phone Versions. Item Reviewed: Yours Creative Onepage Adobe Muse Template 9 out of 10 based on 10 ratings. 9 user reviews.